Pretty, portable and tasty treats! I love it when I serve a dessert that delights people with its visual appeal and its taste. When I told recent dinner guests we were having apple pie for dessert, I’m quite certain they did not expect it to arrive at the table in this form. Perhaps they thought I was going to offer them these apple-cheddar biscuits that taste like pie, but I had another trick up my sleeve. These are fun to make and eat; I think they could be ideal for a summery picnic or potluck meal. Delicious on their own, they are even more delightful served with a scoop of ice cream. Preheat oven to 400F. Line a large baking tray with parchment paper and set aside. Wash apples and slice crosswise into 1/4 inch (6 cm) thick slices. With a one inch (2.5 cm) round cookie cutter or a sharp knife, remove core, making a circular hole in the centre of each slice. 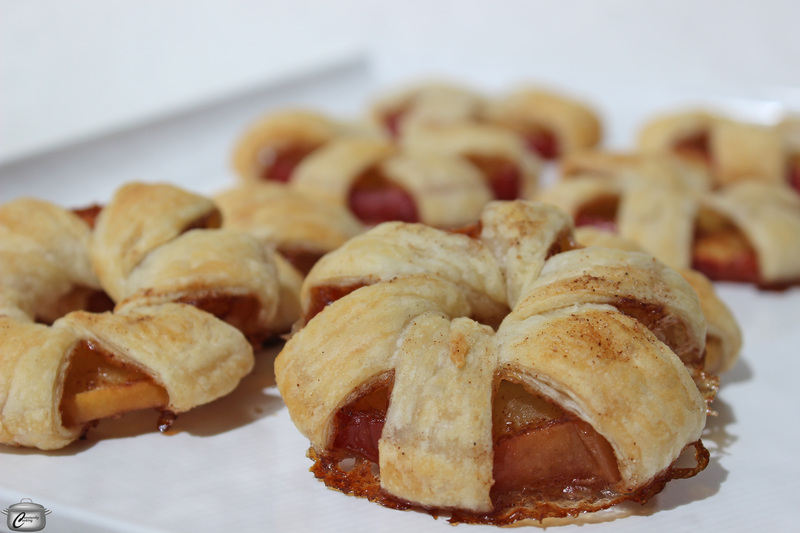 Don’t worry if the apple slice splits – you can still use it. Set cored apple slices aside. Combine cinnamon and sugar in a bowl big enough to hold the largest apple slice. Set aside. Roll lightly floured puff pastry out between two sheets of parchment paper to form a rectangle approximately 10 x 16 inches (24 x 40 cm). With a sharp knife, cut the puff pastry lengthwise into 1/2 inch wide strips – you should get approximately 18 – 20 strips. One at a time, dip both sides of an apple slice in the cinnamon and sugar mixture. Poke the end of one puff pastry strip through the centre of one apple ring. Gently wrap the pastry around the apple (going through the centre hole each time, leaving gaps between the wraps. 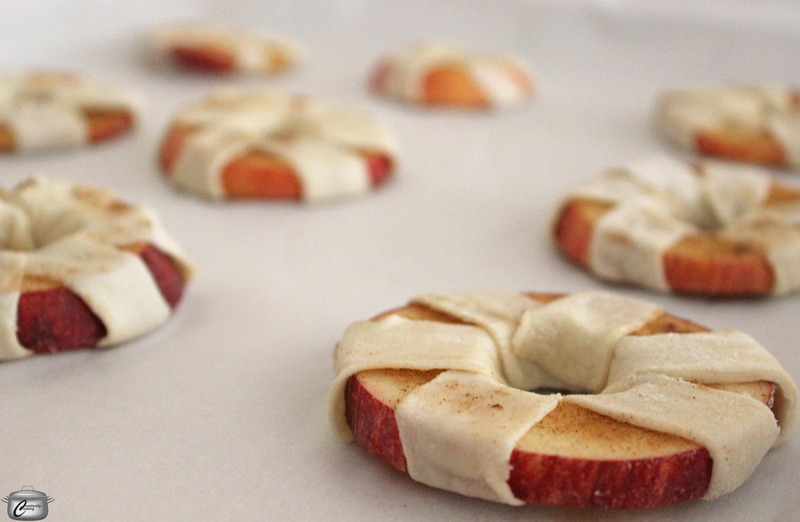 Place wrapped apple rings on the parchment-lined baking sheet. Bake for 22- 25 minutes, until pastry has puffed and turned golden brown. Makes 18 – 20 rings depending upon the size of apples. This entry was posted in Dessert, Fruit and tagged apple, apple pie, apples, different way to make apple pie, fun dessert, ice cream, Paula Roy, picnic dessert, pie, potluck dessert, puff pastry. Bookmark the permalink. What a great idea, Paula! So clever and beautiful looking too. I’m going to try this one. Have you ever tried it with peaches or plums? The only other fruit I have tried it with his pineapple and that was great as well. I think plums would likely be too small. Peaches would work but only if they were large enough. Delicious! My 85 year old father is visiting me and has a real sweet tooth. 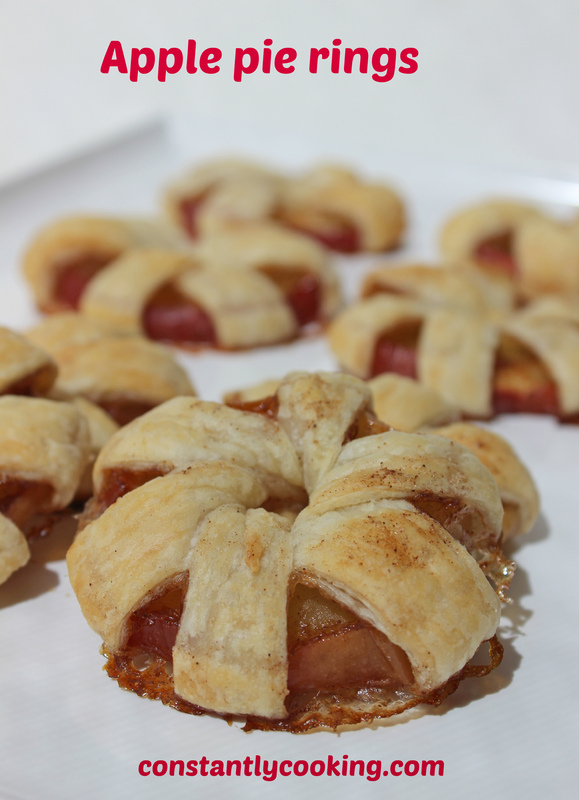 These were perfect – had some extra pastry, so I rolled it in the cinnamon/sugar mixture and twisted them to make some straws. They take a lot longer to make than to eat, but are certainly worth the effort. Thank you!! Great way to use up the extra pastry! You can also brush it with butter and jam and bake…. yum! Glad your visiting father (and you) enjoyed them)!